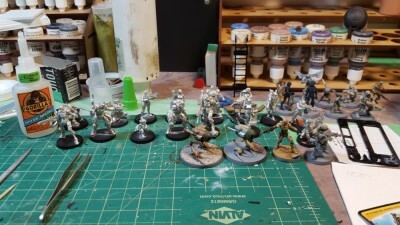 A vast pile of bare pewter Haqqislam figures for Infinity, and a few in progress… Click for larger, as usual. It’s been a quiet month here on the Warbard, but things have been ticking along in real life. The space station scenery for Infinity is taking shape, and today I sat down and cranked through assembling every single Infinity figure I owned. There were far too many boxes and blisters hanging around, so now there’s a long line of bare pewter figures waiting for putty and then primer before actual painting can start! I’ll try and get some space station photos up later this week; I like how it’s coming along. We’re also getting into the convention season locally, with the new LANtasy taking place in mid-March and Trumpeter Salute 2016 over in Vancouver on the first weekend of April. All I’m doing at LANtasy is playing Blood Bowl, probably with my existing Skaven (rat) team, so prep for that is minimal. For Trumpeter I’m running a Pulp Alley game set in the jungles of British India between the wars; I have enough figures for that and enough scenery, but might try and get a few extra figures finished and one or two bits of scenery. I also need to run a game or two of Pulp Alley to remind myself how the rules work, as it’s been ages (probably over a year?) since we last played it!